Early on the morning on January 1, 2018, innocent Dalits who had gathered at Bhima Koregaon, a small village about 30 kilometres from Pune, to offer their salutation to the victory pillar, were attacked by people holding saffron flags. The saffron-flagbearers attacked one and all, pelted stones, torched shops and vehicles. Many innocent Dalits got injured and one person succumbed to the injuries suffered due to stone-pelting. The news spread like wildfire and so did its videos and messages. Agitated Dalit and Bahujan activists took to streets, holding up traffic all across the State. AS stated earlier, Justices P B Sawant and Kolse-Patil, and many other dignitaries from across Maharashtra gathered and conceptualised the programme which was to result in the arrest of at least ten activists on charges of sedition and terrorism, after over six months. In a democratic manner, design of the programme was drawn, speakers were decided, names were mooted, accepted or rejected, and finally they decided to hold the programme with Justice P B Sawant as its president and others like Jignesh Mewani, Umar Khalid, Soni Sori, Radhika Vemula, Prakash Ambedkar as speakers. Funds were to be raised by various organisations through direct collection from the people. Various organisations were to shoulder various responsibilities. As many as 250 organisations came together under the banner of Bhima Koregaon Shaurya Din Prerana Abhiyan. Prominent amongst them were Savitribai Phule Seva Sanghatana, Akhil Maharashtra Karmachari Sanghatan, Lokshasan Andolan, Sambhaji Brigade, Bhartiya Republican Party Bahujan Mahasangh, Kabir Kala Manch, Samata Sainik Dal among others, which various responsibilities. The venue of the programme amongst many other suggestions, was decided to be Shaniwar Wada, the remnant of Peshwa palace in Pune, as a first chapter of the campaign. September 24, 2017: At Mumbai’s Ambedkar Bhavan, a meeting was called, whereat many dignitaries, former police officers and judges gathered and held a discussion on the prevailing situation in Maharashtra. It was everyone’s opinion that some steps had to be taken to ease out the tension between communities and RSS had to be exposed. It was suggested in this programme that on bicentenary of the Bhima-Koregaon Battle, a public programme could be organised. October 2, 2017: A meeting was called by Justices Sawant and Kolse-Patil at Rastra Seva Dal, Pune, wherein the then volatile situation in the State of Maharashtra was discussed. Some people suggested that a programme on occasion of Bhima-Koregaon bicentenary be organised, wherein people could be informed of the real meaning and reason for the battle. Names of various speakers including Ramdas Athawale, Jogendra Kawade, Prakash Ambedkar, Jignesh Mewani, among others were suggested. Justice Kolse-Patil took responsibility to approach these speakers and obtain their dates. In the meeting, unanimous decision was taken to make Justice P B Sawant as the president of the programme. October 6, 2017: Another meeting was called at Panmala Buddhvihar, wherein Pune Coordination Committee came to be constituted. It was decided that funds shall not be taken from any political party. It shall be collected from 260 social organisations working in Pune, and each organisation should contribute ₹ 3000. Once again names of the speakers were debated, unanimously newly elected MLA from Vadgam, Gujarat – Jignesh Mewani, and the mother of Rohit Vemula – Radhika Vemula, were picked from several suggestions. Members of Kabir Kala Manch came to be inducted as part of the coordination committee two days after the meeting. October 15, 2017: Justice Sawant called a meeting at his residence, wherein members from Kabir Kala Manch and other activists were present. In this meeting, it was decided to name the programme to be conducted on December 31, 2017 as “Elgar Parishad”. It was further decided to open a Facebook page by the name of Bhima Koregaon Shaourya Din Prerna Abhiyan. On the said day, responsibility of obtaining permission for programme was shouldered on Savitri Bai Vichar Manch, since it is a registered organisation. It was also decided to hold the programme at the Shaniwar Wada ground, which is considered as the capital of Peshwas, as a bitter-sweet gesture of historical irony. November 9, 2017: The Shaniwar Wada ground was booked for the programme after paying the requisite fee by way of a demand draft. Various organisations and individual activists eagerly participated in Elgar Parishad and did campaigning for the programme. Posters, banners, handbills were taken care of by the participating bodies. A booklet on the issue was prepared by the committee of two persons, including an ex IPS officer, who studied the history to great length and read out its version in a meeting at Nashik, whereat it came to be approved by the participants. This committee was constituted upon the suggestion of advocate Prakash Ambedkar, so that there remained no doubt about the version of history. November 25, 2017: Milind Ekbote, of Samastha Hindu Aghadi, took a press conference and appealed to the Maharashtra government to cancel permission for the programme. He threatened by way of a written press note, that should the government let this programme happen, he would show his might. A Hindutva outfit in Pune threatened to kill JNU scholar Umar Khalid and Gujarat MLA Jignesh Mewani if they landed in Pune. On December 30, 2017, Milind Ekbote took a meeting in Bhima Koregaon, whereat he decided to treat January 01, 2018 as black day and ensure bandh all across the area. On December 29, 2017, memorial of Govind Mahar, who has legend to his credit of having shown courage to cremate the dead of Sambhaji Maharaj son of Shivaji Maharaj, came to be defiled. This resulted into a riot like situation in Vadu Budruk and adjacent areas, however all the villagers acted with responsibility and sorted out the issue amongst themselves and peace was restored. By December 30, 2017, though the issue at the Vadu Budruk was resolved peacefully, it is said that Sambhaji Bhide and Milind Ekbote, instigated the villagers. On December 30, 2017, a message was circulated on social media that there is a meeting called by Sambhaji Bhide in Vadu Village on January 01, 2018 and the supporters should gather in large numbers. On the night of December 31, 2017 Pradip Kand, Anil Kand and Ganesh Kand were threatening hotel owners to ensure bandhon January 01, 2018. Women in the vicinity knew prior about the riot on January 01, 2018, President of Tanta Mukti (dispute resolution) Committee, namely Vaibhav Yadav, had stored sticks and swords in his shop a night before. Suddenly on late night December 31, 2017, a letter was sent to police station, near Bhima Koregaon purportedly written by Bhima Koregoan Gram Panchayat, wherein police were informed about the bandh to be observed next day. Allegedly an MSc in Physics, this Guruji had claimed that he possessed a kind of mango which if eaten could result couples without children birthing one. 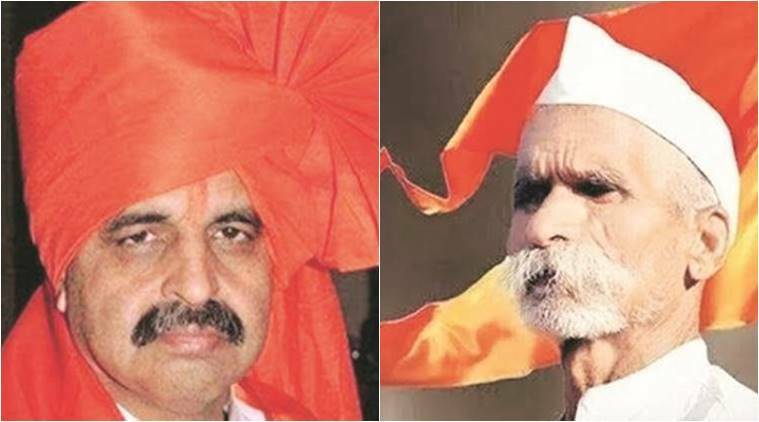 Sambhaji Brigade, a progressive organisation of followers of Sambhaji Maharaj, accuses Bhide Guruji of deceiving people and brainwashing them by presenting Sambhaji Maharaj as religious fanatic. They also allege that he has changed his name to conceal his caste and to resemble a Maratha. A resident of Pune, an ex-corporator, a BJP affiliate, the president of Dharmaveer Sambhaji Maharaj Pratishthan, Samasta Hindu Aghadi, a local politician, known for his inflammatory speeches — Milind Ekbote is all this and more. This champion of invoking communal hatred, was sought to be detained by Maharashtra police way back. In the reports that were sent to the then government, senior police officers had stated that Milind Ekbote was mischievous and has been spreading false information with respect to Shivaji Maharaj and Sambhaji Maharaj to invoke communal hatred against Muslims. He has been causing his followers to celebrate December 6 (the day of demolition of Babri Masjid in Ayodhya) like a festival. To his credit, there are many crimes registered, most of which pertain to causing destruction of public property or invoking hatred amongst communities. As stated earlier, the programme happened under the chairmanship of Advocate Prakash Ambedkar (the president of the Bhartiya Republican Party) along with (Retd) Justice B G Kolse Patil (Bombay High Court), Soni Sori (tribal activist and Front Line Defender award winner), Radhika Vemula (the mother of late Rohit Vemula, a Dalit scholar), Prashant Dontha (Dalit scholar) Jignesh Mewani (MLA Vadgam in Gujarat and Dalit rights activist), Umar Khalid (JNU scholar), Vinay Ratan Singh (national president Bhim Army), Ulka Mahajan (tribal rights activist), Maulana Abdul Hamid Azahari (secretary, Muslim Personal Law Board) — among others. The programme was inaugurated by Radhika Vemula by breaking the four pots, which symbolised breaking the four-tiered caste system in India. The programme was a blend of cultural events and speeches by the above-named dignitaries, whereat government inactions, functioning and the growing influence of Rashtriya Swayamsevak Sangh, atrocities on Dalits, tribals, NT-DNTs, right to food, victory of Jignesh Mewani in Gujarat Assembly elections, situation of adivasis in Chhattisgarh, policies of the state government, etc. were addressed by the speakers. The programme ended with all the participants taking pledge that they shall strive hard to protect the constitution, its values and ensure brotherhood amongst all people; further that they shall not fall prey to false propaganda spread by BJP, RSS and other communal, religious fanatics, no matter which religion they belonged to. Of all things, it is important to note that the speakers pledged to not vote for BJP ever again. After the programme got over, some of the dignitaries went to Bhima-Koregaon Vijay Stambh that night itself and offered their homage. Early on the morning on January 1, 2018, innocent Dalits who had gathered at Bhima Koregaon, a small village about 30 kilometres from Pune, to offer their salutation to the victory pillar, were attacked by people holding saffron flags. The saffron-flagbearers attacked one and all, pelted stones, torched shops and vehicles. Many innocent Dalits got injured and one person succumbed to the injuries suffered due to stone-pelting. The news spread like wildfire and so did its videos and messages. Agitated Dalit and Bahujan activists took to streets, holding up traffic all across the State. The situation became so tense that at any minute, the entire State could have been up in flames. However, due to timely intervention of Advocate Prakash Ambedkar and declaring a peaceful bandh and protest on January 3, 2018, the situation was brought under relative control. He along with the others requested people to maintain calm and sought judicial inquiry of the entire episode. Still, tension continued on January 2, 2018. True to the expectations of Justice Sawant and Justice Kolse-Patil, an unexpected exhibition of fraternity came to be seen in the whole State, wherein people from various walks of life, irrespective of their caste or religion, came together and peacefully protested against the attack on Dalits on January 1, demanding action against the perpetrators. “… Chairman Sir, we all know that since 200 years was completed since the battle of Bhima Koregaon this year, thus large number of people were to come to offer their salutations. Every year people come there. After Bharat Ratna Dr. Baba Saheb Ambedkar offered his salutation at that place in the year 1929, it became a custom there and accordingly large number of people go there. Thousands of people are there every year. However, it was expected that owing to the completion of 200 years people will remain present in large proportion. Therefore, that preparation which the government is required to do, was done much earlier. Specially, state government decided to remove encroachment around the victory pillar which was there since years. Few people went to court saying that the land is owned by them and there no such type of salutation should happen. For that we appointed special public prosecutor. Social justice Minister Sir gave personal attention to it. By removing the encroachment, for constructing a protective wall on the premises of 10 acres fund of 2 crore rupees has already been given. At the same time BARTI has prepared a proposal with regards to establishing military and police pre-training academy. Through BARTI with intent to protect, to maintain the pillar and to preserve its piousness, appointment of security guard and other issues has been on since approximately six months. For preparation of this program guardian minister of Pune, Social Justice state minister had gone there a day before. At night they took a review. On the second day, meaning on the day of incident Social Justice Minister and Social Justice State Minister were present there … One SP/ two additional SPs five DY SPs, 12 PI, 52 API, PSI, 537 police, 2 riot control squads, 2 bomb defection squads, 3 SRPF Company, 300 homeguards were there. An arrangement to this extent was made. At that place complete wireless machinery was activated. Chairman Sir, if we take the information about this incident that has happened, a pole and iron frame was installed approximately in the evening at 1900 hours, in the square of Vadu gram panchayat. Thereafter at about 2200 hours a hoarding was fixed in that frame. On that, information with respect to how Govind Gopal Gaikwad performed the last rites of Second Chhatrapati of Swaraj Sambhaji Maharaj was put up. Some people took objection to some of the contents on it. In overall I do not see any trouble with the upper portion of the content. On that it was written, “Jai Shivraj Jai Bhim, Second Chhatrapati of Swaraj Sambhaji Maharaj was extremely brutally murdered on March 11, 1689 on the orders of Aurangzeb Badshah at Wadu Budruk. At that time very inhumanly his body was cut into pieces and thrown on the banks of Bhima river at Wadu. A fatwa was issued by Aurangzeb Badshah that whosoever will perform last rites of his body shall be beheaded. Because of that no commander or soldier mustered courage to perform last rites on the body of Sambaji Maharaj. At that time a brave youngster of village Wadu, Govind Gopal Mahar came forward and said I will not tolerate such mutilation of my king and thus he collected all the pieces and stitched the body of Sambhaji King. No villager was ready to offer place for last rites of Chhatrapati Sambhaji Maharaj out of fear. In that situation Govind Gopal did the last rites of Sambhaji Maharaj in his own place at Maharwada. To honour this work of Govind Gopal, Chhatrpati Shahu Maharaj, first of Satara province gifted 45 bhigha of land to Govind Gopal. Govind Gopal spent his entire life serving the burial memorial, Vrindavan, of Chhatrapati Sambhaji Maharaj. This memorial is of Govind Gopal. A board was put up at the memorial of brave Govind Gopal, courtesy descendants of brave Govind Gopal Mahar Gaikwad, Wadu Budruk Taluka, Shirur District, Pune. Any person committing any damage or loss to the board shall be subject to legal proceedings. In this manner I have a picture of it. (Said picture is shown everywhere in the house.) Such a board was installed in front of gram panchayat at that place as well. Now at this (board) some of the villagers gathered and raised objection against it in regard to the contents of it which read, “no commander or soldier was mustering courage to perform last rites on the body of Sambaji Maharaj”. On that regard a dispute got created in large proportion. I am not going into any history. Government has nothing to say with regard to that history. However just so that the dispute in that village stops I am saying that, on one side it is the fact that Govind Gopal Gaikwad had performed last rites. This is the legend at that place and there are many citations about it. On the other side some of the villagers are of the opinion that Shiwale Deshmukh who was there is the one who performed the last rites and the dispute is of many years. Of that dispute this board got installed of such nature approximately at 2200 hours. People gathered after the board was installed and by morning the gathering had increased proportionally. Thereafter they broke that board. Not only the board but the umbrella that was there on the memorial of Govind Gopal Gaikwad, was also broken, lot of altercation followed. There became two groups in the village. Dalit community was on one side and upper caste community was on the other side. There was lot of quarrel and arguments exchanged between them. After the incident that took place approximately on December 29, 2017, police superintendent himself went there. He took information by going there after taking information, names of approximately 54 persons were given in police complaint. Of those people ascertained and who did the action likewise, people from both the sides sat together and decided that, action should not be taken against all such people. “Don’t invoke Atrocity Act against all. Those nine people who actually did it, their names will be given.” Accordingly, atrocity came to be filed against only nine people. Thereafter complaints from both the sides with regards to destruction came to be made. Other side put up such board, hurled abuses. All the complaints making such grievances were noted down by police. One of the important things to note of all this is that this board of Govind Gopal Gaikwad was not installed by people in the village. Police is investigating in depth in this regard. That board has been installed by some lawyer from outside. They are also activists, however what their intention was has not been understood by anyone. Because people of the village got upset, after the board was broken, however that board was not made by the people in the village. No such thing comes to the notice. If we take an overview, then after everything happened on December 30, 2017, a meeting took place. After the meeting both the sides finished their dispute at that place, decisions such as all this should be finished. With regards to that decision everything will get normal, was the understanding of the police. On December 30, 2017, Milind Ekbote took meeting in Bhima Koregaon, whereat he decided to treat January 01, 2018 as black day and ensure bandh all across the area. On December 30, 2017, a message was circulated on social media that there is meeting called by Sambhaji Bhide in Vadu Village on January 01, 2018 and the supporters should gather in large numbers. On the night of December 31, 2017, Pradip Kand, Anil Kand and Ganesh Kand were threatening hotel owners to ensure bandh on January 1, 2018. Women in the vicinity knew prior about the riot on January 1; president of Tanta Mukti (dispute resolution) Committee namely Vaibhav Yadav, had stored sticks, swords in his shop a night before. On January 1, 2018, a group of people holding saffron flags in their hands, and shouting slogans were roaming around on bikes, they were stopping vehicles bearing blue flags. They were assaulting Ambedkarite people sitting in the vehicle inhumanly. A mob of Hindutva people had stopped at village before proceeding to victory pillar, where some of the leaders of the mob were heard saying “don’t be afraid, police is with us, later on they will do their duty”.